As around 40 police officers watch her progress on a large screen, officer Chanika Sookreang's digital double goes from body to body in the ruined city, photographing tattoos, faces—anything that can later be used to establish who the victim was. "VR is good as it allows us to be trained before we go to the actual scene," says Chanika, who has firsthand experience in relief work from the aftermath of the 2004 tsunami. 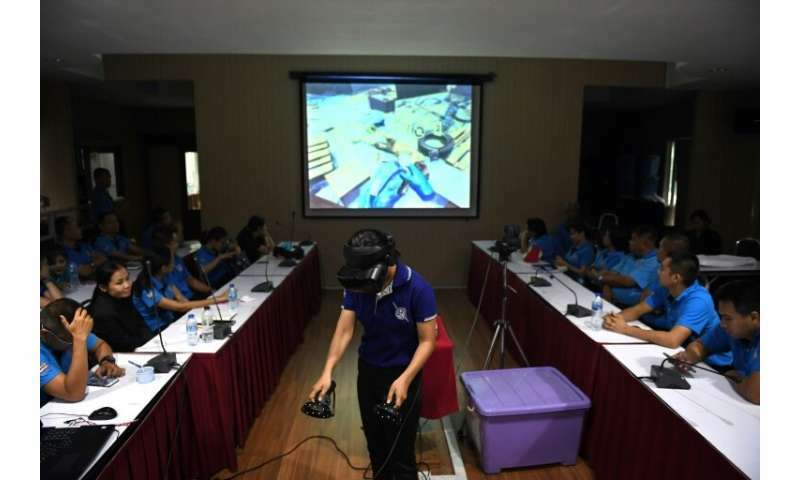 The International Committee of the Red Cross (ICRC) developed the new "game" and is testing it out for the first time on teams in Thailand's Chonburi province in a bid to recreate the daunting challenge of identifying bodies, which can help in repatriating them to families. Dozens of forensic experts from the Red Cross are stationed around the world to help countries respond to tsunamis, earthquakes and other disasters. Training for refugee camps and high-risk disaster hotspots like Indonesia have long relied on heavy mannequin models. But a former Swiss army officer turned video gaming enthusiast has recruited graphic designers from the gaming industry to help create the ICRC's first Virtual Reality unit in Bangkok, which will allow teams to reach a wider audience. "If you do training in a classroom, like how to put a body into a bodybag, it is excellent because you can have the weight," says Christian Rouffaer, head of the VR team. By contrast, the new simulation is "weightless, but what you will have is all the risk factors" complicating search-and-rescue missions such as the presence of animals and dangling electrical cables, he tells AFP. In one sequence a rat scurries across the ground as the rescuer tries to retrieve the corpse of a woman, whose arm comes detached when the body is flipped over. To make the training more realistic, the ICRC team worked with forensics specialist Ivett Kovari. She explains that she came up with the idea for the rat "because that's what happens in reality". In the field, responders have to search for remains, take notes and photographs, and transport bodies. A diligent inventory of the victim's belongings from phones and jewellery to family photos and ID cards is also crucial, Kovari tells participants in Thailand, warning that otherwise "this information is going to be lost forever". Virtual reality is increasingly sought after for skills training, from hospitals to industry. Disaster zone rescue is the latest in a series of VR simulations from the Red Cross. Trainees can already visit overcrowded prison cells to check on conditions—one of the group's global mandates—or plunge into the chaotic world of a refugee camp to assess needs of those displaced by conflict. Some are even intended for mainstream use, such as an immersive first aid game created at the request of the British Red Cross. Another game looking at earthquake response is currently in production. A decade ago the ICRC produced research on gamers committing war crimes in the virtual world, which sparked ridicule. But the uproar led to the agency working with the creators of war video game "Arma 3" to create a new iteration that included a more humanitarian perspective, from the workers on the ground to the complex rules of engagement in conflict. 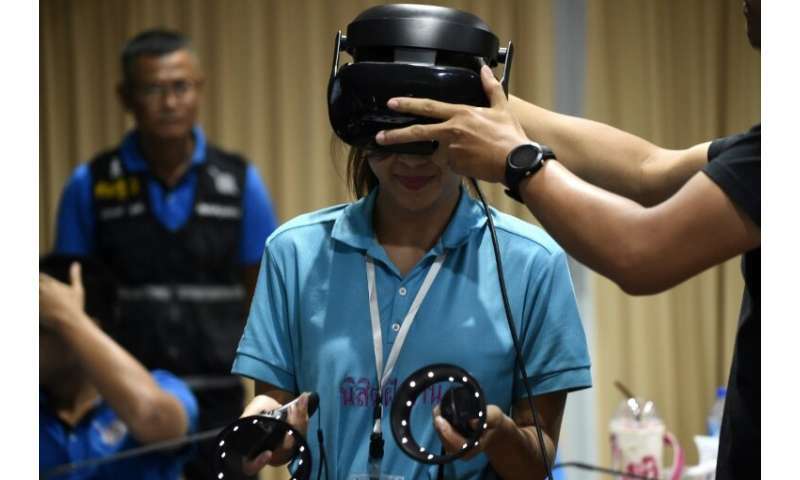 Countries like Thailand, which lack big budgets for quick relief response, are keen to take advantage of VR's cost-saving measures. The head of Thailand's disaster victim identification department Nithi Bundhuwong attended the training in Chonburi and was enthusiastic about a virtual crime scene immersion program he showed off on his smartphone. "In the past, training was based on repeating (the same exercise) again and again, and it was a waste of time and money," he tells AFP. "Thanks to virtual reality, we can simulate different scenarios" from crime scenes to the chaos of a natural disaster, he added.